I have attended NBCC’s Annual Advocacy Conference (now called Summit) as a metastatic breast cancer patient every year since 2006. The content of this Summit, held on May 5 through May 8, was significantly different from past gatherings. First, this year’s presentations clearly emphasized what we do not know about breast cancer. Why do some breast cancer cells remain dormant years and even decades after the primary tumor was removed and then return as invasive or metastatic disease? What distinguishes different types of breast cancer, and why does this make breast cancer difficult to treat? What causes some cancer cells to metastasize or travel to other organs of the body? How and why do cancer cells keep changing over the course of treatments, making treatment selection and efficacy difficult? The lack of scientific answers to these questions clearly hinders efforts to end deaths from breast cancer and extend the lives of metastatic patients. Alana Welm, PhD, shared her success to develop different types of metastasis models in living mice so that personalized breast cancer treatments can be tested within a living organism. In my view, these summit presentations furthered the goal of the metastatic community to educate the larger breast cancer community about our disease and need for treatments to extend our lives. Finally, the Summit offered excellent sessions on how patient advocates can learn from other social change movements, like the AIDS movement, to redefine the status quo, empower patients through education about their disease, and pressure for more treatment options. As a patient advocate who has worked diligently on behalf of metastatic breast cancer patients for many years, I personally support NBCC’s Breast Cancer Deadline 2020. When scientists can explain how and why cancer cells travel to other parts of the body, metastatic patients may realize treatments to keep their disease contained. And, since advocacy is not just about oneself, I welcome research that will prevent my sons and nieces from getting breast cancer or being told they have metastatic breast cancer. The weekend of April 28, Judy and I attended the LBBC (Living Beyond Breast Cancer) conference on metastatic breast cancer in Philly. 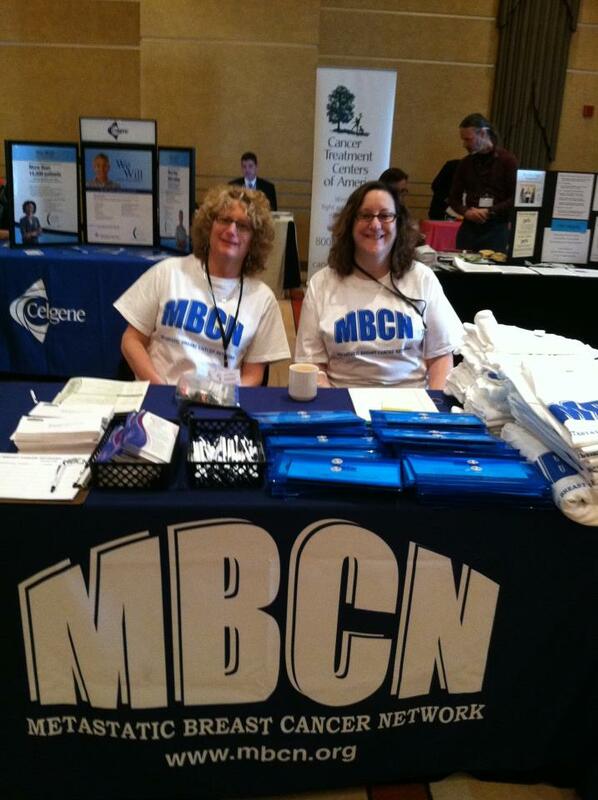 We met many of you when you stopped by our MBCN table in the conference room. Thank you to all who stopped by, it was a pleasure to meet you. Just being in the main room with over 200 women living with the disease (some for over 20 years!!) was humbling and yet, inspiring. The day began with a panel of experts weighing in on a number of issues. In a rather candid discussion, several of the doctors discussed the challenges they experienced in advocating for their patients. It was affirming to hear that doctors are frustrated in dealing with the FDA and with insurance companies and are actively advocating on behalf of their patients, for current treatments, more research and more access to potentially beneficial medications. We need more advocacy and easier access to medications! On Sunday, I attended a session on sexual intimacy and was pleasantly surprised by the forthrightness of the MALE speaker who, with humor and respect, spoke directly about the impact of cancer and treatment on sexual well-being. There was a group of younger women with mbc who unabashedly asked questions that I was too shy to ask — thanks to this group!! Overall, the conference provided women like us a chance to connect. Please keep in mind that the MBCN annual conference is October 13 in Chicago and will provide another opportunity to learn and to connect. Let’s face it, many of us are struggling in the sexual intimacy arena. Whether sexual problems are a result of chemotherapy, surgery, radiation, hormonal changes and/or emotional concerns doesn’t really matter; the reality is that most of us feel the impact of cancer, in the bedroom. If you are like me, you may wish that your body would feel the way it did before cancer attacked it, you may feel embarrassed about the changes that have occurred and wishful for a more comfortable experience with your loved one. You may also feel a bit reluctant to share these feelings with others. To help you with some of your concerns (and mine), here is a link to a recent program held by our sister organization, LBBC (Living Beyond Breast Cancer). The expert speaker was Kara M. Nakisbendi, MD. Even though this program is not exclusively for metastatic women, I hope that you will find it as helpful as I did. You are currently browsing the MBCNbuzz blog archives for May, 2012.